Raising Children in Freedom: My children have no limits! My children have no limits on any of the things they do. They've never had any. When they were babies, they were free to breastfeed as much, as long and as often as they wanted. When they started crawling and touching things, they were free to explore. They were allowed in the kitchen and everywhere. I never put a child-proof fence as a barrier to the pantry or locked the cupboards. Nothing at all was off-limits. Which was a lot of work for me, of course, because I had to be always there, watching them and describing the surroundings to them. In case they decided to take a knife out of a drawer, for example, I would show them how to handle it and let them feel the blade so they knew what knifes are for and that they can hurt. Although I had practically no life of my own when they were so little, I'm immensely happy to have followed this approach from the beginning. I can proudly say that my boys continue to be curious explorers, and that is the basis of their learning. When Dave was 2 he was climbing trees (to all the other present mums and some dads' horror) and I would just stand under the tree, ready to catch him in case he fell but making sure not to show him any worry. He never fell and he didn't go from there to climbing mountains. In fact, he's always been very cautious. He knows his own limitations and, if there's something he's not confident in doing, he doesn't do it; I don't push him either. I don't watch television. I'm not against it. I simply don't watch it because I get bored. So, because it's something I don't do, Dave and Alex were not curious about it until they were around 3 or 4 and saw other people getting hypnotised in front of a box with moving images and voices. That's when they started asking me to turn the telly on. It was never really television, but DVDs, and to this day, they still only watch television (the cartoon network on cable TV) when we go to my parents' once a year. I have never offered to turn the television on for them as a way of keeping them entertained, busy or babysat while I'm doing something else. I do offer to read books with them, because I love reading and it's something we do together. Or I'll ask them to go out for a walk with me. Or any other activity I enjoy doing. I never offer TV because I don't like it myself. But if they ask for it, which they do, every day, I always say yes, of course. There are no limits on how many DVDs they can watch on the telly or YouTube videos on the computer. The same goes for computer games. When all the kids their age were playing with the Nintendo DS, Ipads and their parents' mobile phones, Dave and Alex were still happy with blocks and puzzles. Dave, especially, had no curiosity about the Nintendo DS and I never had to buy one. We used to play Lego games together on the computer. They never wanted to play alone, and sometimes we spent hours on them, until I got sick of it! It's only been for the last six to eight months that both Dave and Alex have started playing games on the mobile and tablet without my help. They spend a lot of time on them, and again, I don't set any limits. I don't play video games myself, but I don't think they're bad at all, on the contrary. I don't know any other mums around here (only through the internet I do, but they live too far from us, sadly) who give children complete freedom like this. I am aware of the limits other mums set and I respect them, of course. Their kids go to school, they have schedules, meal times and bed times. They have a 'no TV during the week' policy and only one hour a day at the computer. We, on the other hand, have so much time that we can spend as much of it as we want doing whatever we want. And guess what, Dave and Alex don't spend all day watching telly and playing video games! They still want to read, draw, jump in the trampoline, go to playgrounds and play with other children, ride their bikes, help me in the veggie patch (sometimes), play with their Lego and blocks, etc. Because they have no routines or time limits they don't get anxious about how much time they have left. 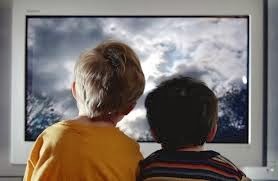 A friend of mine banned television and video games altogether because her kids would get all wound up and aggressive when playing games or totally passive for hours on end in front of the idiot box. She said it was a scary sight, as if their brains had been sucked out of their skulls. My kids have never done that. I guess they have a short attention span, like me. After the ban, when they came to my house, the first thing those kids would ask was permission to watch DVDs or play video games, which is the last thing my kids want to do when they have friends over. But I said no, sorry. If you come to my house is to play with your friends, not to ignore them. What did you think? I'm only my own children's cool mum and they're not going to pay for what other mums do. As you can see, I'm a bad influence on other children. My friend has already noticed and she doesn't want me minding her son anymore. I also had my doubts when my kids witnessed how she smacked her kids and used time-out as a way of teaching them a lesson. But I don't see the point in hiding reality from my children. So I talked to them and told them I don't agree with that and I feel very sorry for children who are hit, shamed or manipulated by their own parents. My children haven't had the need to lie or hide things from me yet. I hope they never do. I'll let you know how we go when they're teenagers, but I'm pretty confident it won't be as hard as everyone insists on saying it is.